Visiting Barumini and its territory means discover a world rich in history and tradition. From the first moments in which you approach this small village of Marmilla, located in the heart of Sardinia, you can breathe a particular atmosphere, that one of a special place, deputed since the Old Age at seat of power and central part of a rich land full of marvels and fundamental way of communication. The most important of witnesses of this glorious past is undoubtedly Su Nuraxi archaeological zone. 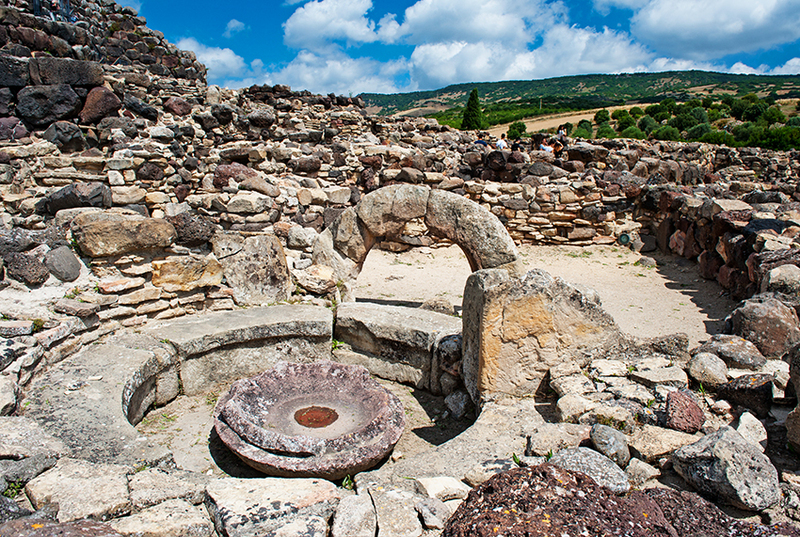 Discovered and brought to light in the Fifties, during excavations conducted by the great archaeologist Giovanni Lilliu, the area consists of an impressive complex nuraghe, built in different phases as from the 15th century BC and an extended village of huts developed all around it during the following centuries. A wonderful place that now since 1997 has been enrolled in Unesco World Heritage Lists because of its uniqueness. A great heritage, that one of Barumini, which has been enriched recently of another wonder: Su Nuraxi ‘e Cresia. 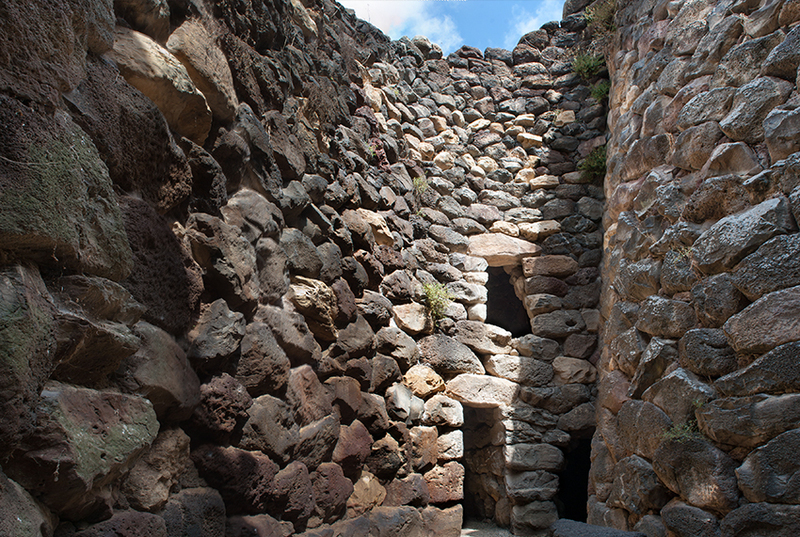 Another complex nuraghe brought to light in the Nineties during the restoration works of Casa Zapata, the old noble residence of Zapata family, coming from Aragon, built on the complex nuraghe as from the end of 1500. 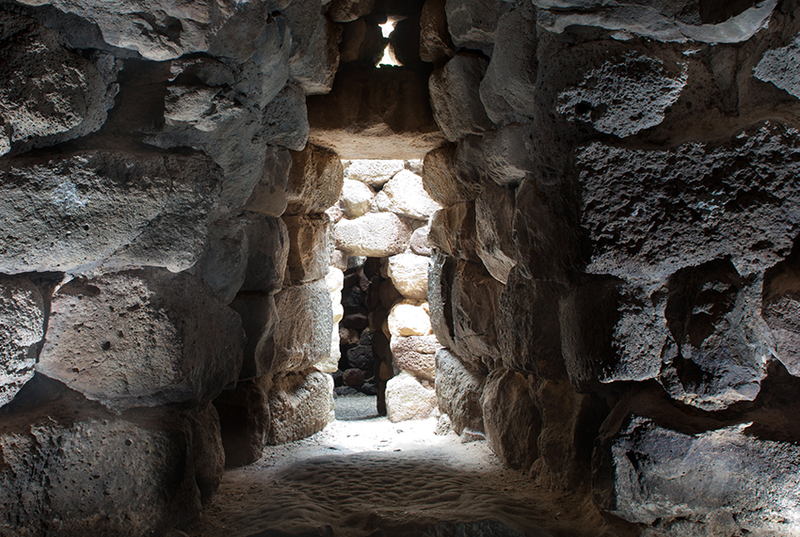 So it’s remarkable to enter into a 16th century palace and then unexpectedly find yourself facing a very impressive nuraghe that you can visit by elevated walkways and glass floors making your viewpoint unique and inimitable. Today the Spanish residence, consisting not only of the palace but also of a beautiful garden overlooking the parish Church, a large court and agricultural set of buildings built as from the beginning of 1900, is the seat of the so-called Casa Zapata Museum organized into three sections: archaeological, historical and ethnographic. The protection and enhancement of this extraordinary heritage has been entrusted to the Fondazione Barumini Sistema Cultura, which with the opening of the new Centre of Cultural Heritage Communication and Promotion Giovanni Lilliu, today offers many interesting exhibitions and aims to promote Barumini as a meeting and enhancement point of the Medio Campidano Province. Educational WorkshopsGreat news is represented by the Educational workshops that enrich and complete our large cultural offer and with whom it is addressed in particular to all schools, suggesting an innovative visit to our structures which aims both to inform and educate. It is possible to visit the Cultural Heritage of Barumini and enjoy the many services offered by the Foundation Barumini Sistema Cultura all days of the year. For further information, please also see Openings times & Visitor Policies and Admission fees. The archaeological zone of “Su Nuraxi”was discovered and brought to light by the archaeologist Giovanni Lilliu during the Forties and Fifties and because of its uniqueness has been enrolled in Unesco World Heritage List in 1997. The Nuragic civilization developed in Sardinia during a period of about 1000 years (1500-500 BC) giving rise to a very complex social structure, characterized by communities divided into different social classes to which families or clans belonged. 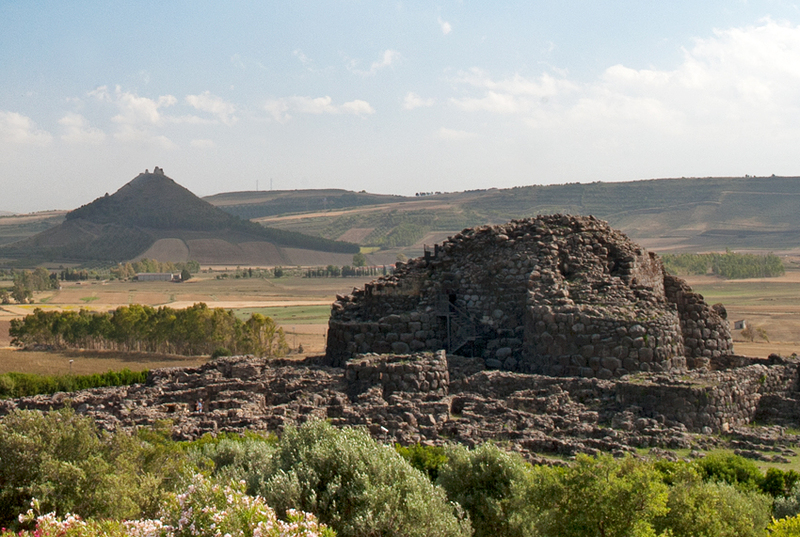 It is named after the most characteristic monument of that period: â€œthe Nuragheâ€ a word that means “pile of stones” and “cavity”, which goes to indicate a type of military architecture with turreted walls. So far, across the island more than 7000 nuraghes (single towers and complex nuraghes) were surveyed and in the territory of Barumini about thirty of them appear. Su Nuraxi is the most representative of complex nuraghes, i.e. consisting of more than one tower. Their building in Sardinia is primarily done between the Middle Bronze and the Recent Bronze Age with a strictly military function; even if they are older of about 3000 years, in fact, they were very similar to medieval castles and were used to defend the surrounding lands. Subsequently they were adapted and reused up to the Iron Age and sometimes they were also used by people who took the place of Nuragic ones. Su Nuraxi presents a cultural stratification of more than 2000 years, i.e. from 1500 BC to the 7th century AD. As regards the realization of â€œSu Nuraxiâ€, it is now possible distinguish different stages of development, thanks to the identification of the building sequences and to the evidence provided by the material culture. The main building material is basalt, a volcanic hard rock that in this territory can be only found on the slopes of the Giara plateau. In the Middle Bronze Age (1500-1300 BC) the main tower (the keep) was built, i.e. 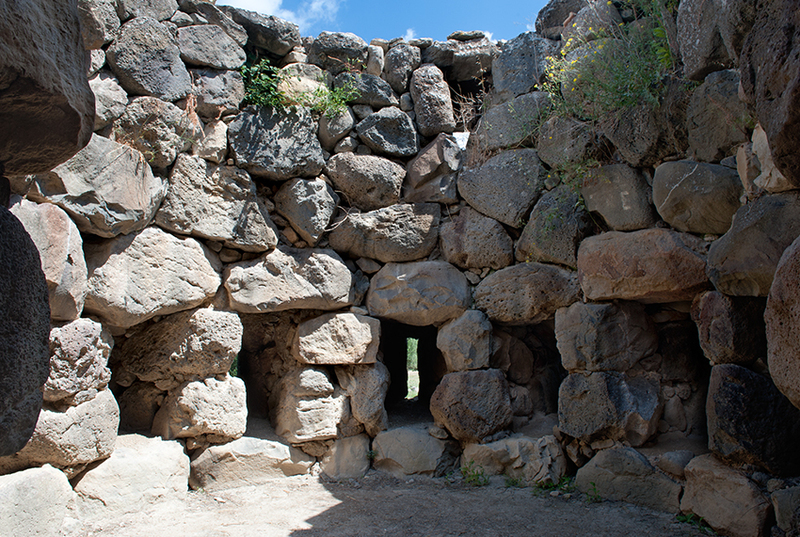 the simple nuraghe with tholos. 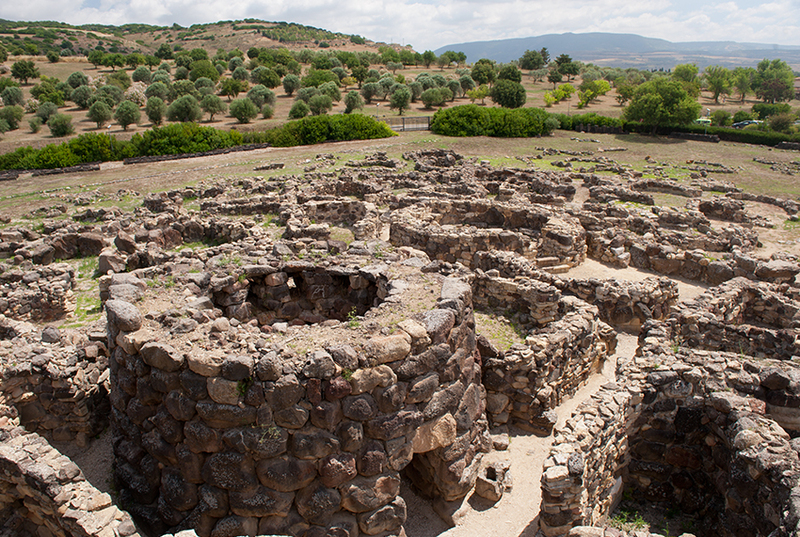 “Tholos” is the term used to denote a truncated cone tower made up of circular rooms with jutting out walls, i.e. consisted of large stone blocks decreasing in size as they tapered toward the top, and completed by a false dome-shaped roof. The central tower or keep (originally 18,60 metres high) was made up of three rooms placed one upon the other communicating among them through some staircases obtained inside the thickness of the wall. Then, during the Recent Bronze Age (1300-1100 B.C.) four towers, originally 14 metres high, joined by curtain walls and oriented toward the four cardinal points were added to the original single tower forming a quadrilobate bastion. The main entrance of the fortalice, situated in the South-Eastern curtain wall, leaded into a half-moon shaped courtyard, which allowed to connect rooms of several towers and was equipped with a well. All four towers consisted of two rooms, which had also a circular base and a false dome-shaped roof, placed one upon the other and completely independent between them. Rooms at the ground floor were provided with embrasures, arranged into two rows and separated by a half-height wooden platform. During this same period the oldest clump of huts of the village arose (of which few traces now remain) and 3 towers, being part of an encircling outer wall prepared for the external defence of the quadrilobate rampart, were built. During the Late Bronze Age (1100-IX century BC) the towered defence wall was renovated and enlarged by the addition of other towers, while the quadrilobate bastion was covered by a masonry sheath, about 3 metres in thickness, which blocked the original entrance at the ground. This last one was so replaced by a new rectangular raised entrance obtained within the mass of the reinforced North-Eastern curtain wall. This massive masonry reinforcing sheath also occluded the embrasures of the rooms at the ground floor into the towers being part of the quadrilobate. During the Late Bronze Age, most of the houses of the village were also built; they had a circular base and consisted of one only room covered by a wooden conical roofing. 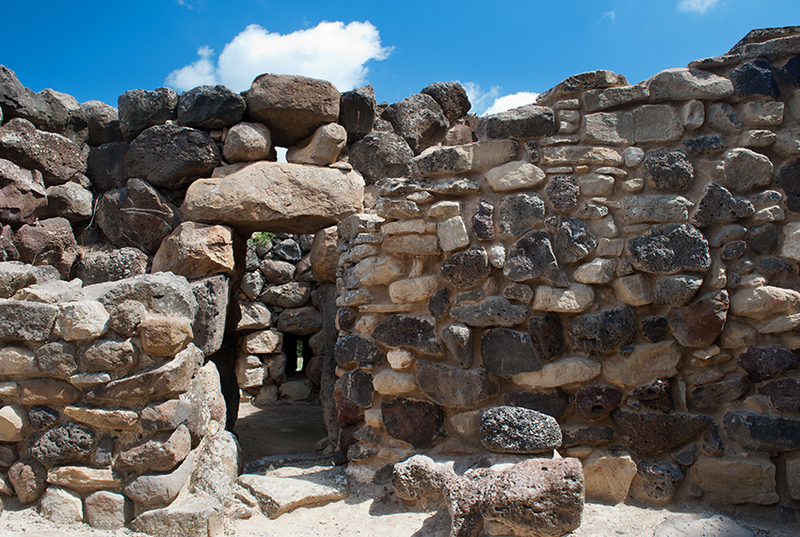 One of the most important structures being part of the Nuragic complex, built during that time, is the “Hut 80″ also called “Hut of Reunion”, “Council Hall” or “Curia”. It is a large circular building provided with a circular stone bench arranged around the inner perimeter and five niches on the wall, where archaeologists have found several elements probably used during some religious rituals wich suggest us that inside it some very important public events must have taken place. At the beginning of the last period of the Nuragic Age, called Iron Age (IX-VI century BC), Su Nuraxi was completely destroyed and on the remains, next to both the external defence wall and the nuraghe, a new clump of huts was built as from the early decades of the VII century BC, which develops fine techniques and urban forms belonged to a society who was renovating and growing both internally and for external contacts and stimuli. At this time, the climate becomes more peaceful and stable and the military life is now a memory of the past. During this period new dwelling typologies were built the insulae with a central court. These huts have a circular shape and rooms, mostly quadrangular and probably covered by a wooden roof, are put in a radial and centripetal arrangement all around a circular paved open-sky courtyard. The most significant room is the so called “rotonda”, an elegant small room which in the original time could have had a false domed roof; this room is provided with a paved floor, a circular stone bench and a basin in the middle used to contain some water, as it was probably used to practice some lustral rituals connected with the cult of waters. These huts are now brought to light in a small number of nuraghes and those ones of Barumini reach the higher degree of complexity and change. In the V century BC the Nuragic Civilization took its place to the Punic occupation and the locals came into contact with a different culture. Apart from some progressive material input from the Punic cities, the physical appearance of the village and the lifestyle of its inhabitants didn’t suffer a big change; however, they had no development, rather a gradual decline of housing and population was the result. During the historical period, II-I century BC, the settlement was reused and adapted by the Romans, who in some cases used some environments as burial places. The structure continued to be inhabited until the III century BC and later it was sporadically attended until the Early Middle Age, VII century BC.